A recuperating Kristin Chenoweth kept a smile and a light-hearted tone on "Live! With Kelly & Michael" Friday as she described the injuries she recently suffered while filming "The Good Wife," but that didn't make the incident sound any less frightening. Chatting with Kelly Ripa and new co-host Michael Strahan, Chenoweth described the incident that sent her to the hospital on July 11. We've been personally obsessed with hearing more about the reported "Bridget Jones's Diary" threequel, but we'll take Renee Zellweger updates where we can get them. Lately, Variety says, the actress has been at work on fashioning her directorial debut, "4 1/2 Minutes." Zellweger's set to star as well as helm the comedy, which'll also star Johnny Knoxville. The former "Jackass" performer will portray a "commitment-phobic, train-wreck of a comedian" whose life is a mess, Variety reports, and so he picks up work as a caretaker for the genius son of a single mother, played by Zellweger. Written by "Warrior's" Anthony Tambakis, the story is based on the life of actual stand-up comic Dov Davidoff, and is set in the world of New York City's comedy scene. The last time MTV would have a major opportunity to show a preview clip for a new "Twilight" movie, the network was missing one of the franchise's biggest stars. But at least they had the preview clip, right? During Thursday's VMAs show, MTV rounded up Robert Pattinson, Taylor Lautner and other "Twilight" stars - no, no Kristen, she was at TIFF - to debut a preview for the final "Twilight" installment, "Breaking Dawn - Part 2." 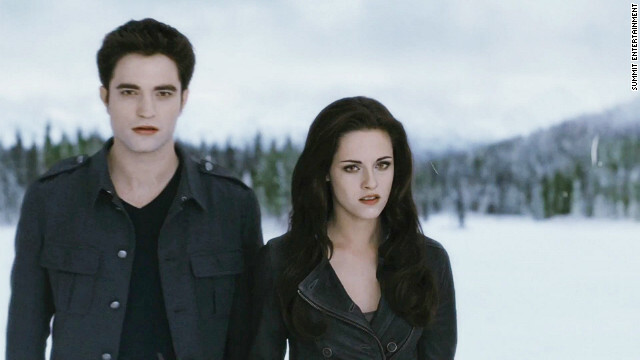 The minute-and-a-half clip summarizes the action to come as the Cullens prepare for an epic battle with the Volturi. "Breaking Dawn - Part 2" opens November 16. MTV VMAs 2012: What's the verdict? The biggest night in music television was ... fine, we guess, but it definitely lacked the reckless, "what's-going-to-happen-next?" abandon that we've come to expect from MTV. Maybe we're just getting old ... or maybe, after 29 years of putting on the show, it's MTV that's aged. And we know it's not just us, because culture critics - those who weren't tasked with watching the Democratic National Convention, which was also on as VMAs host Kevin Hart flailed, One Direction sang and Lil Wayne looked bored - weren't all that taken with this edition, either. While Robert Pattinson has been working the late night circuit, endearing audiences with his charmingly respectful decline to discuss That Thing That Happened, Kristen Stewart's been M.I.A. from the public eye. On Thursday, though, Stewart resurfaced at the Toronto International Film Festival in support of the screening of her film, "On the Road."